In 1725, An Account of Several Workhouses for Employing an Maintaining the Poor describes workhouses in operation in Newport Pagnell, Lavington [Lavendon], North Crowle [North Crawley], Olney and Hanslope. Olney was the home of Matthew Marryott, a promoter of the workhouse, and whose activities were probably a significant impetus behind the publication of the book. Newport-Pagnel, Bucks, Dec. 31, 1724. When any poor Person can be provided for at an easier Rate by the Parish, than by sending them to the Workhouse, the Person is not sent. All who are maintain'd in this workhouse, are also lodg'd and kept to Work, the Benefit whereof is taken by the Overseers of the Poor, and what the Work of the People in the Workhouse wants of maintaining them, the Overseers supply. By this Means, the Poors Levies, which us'd to be seven Six-pences in the year, are reduc'd to three. There is a Master appointed over the House, his salary is 17l. per Annum ; his Office is to keep the Poor to their Work, to buy in all Provision for the maintenance of the Poor, see to the Dressing and Distribution of it, and to give an Account to the Overseers of the Poor of what is earned or expended. The Poor are allowed Meat three Days in the Week, upon others Milk, or Milk-Porridge; they have small Beer, and coarse wheaten Bread, with Butter or Cheese, or Broth for Breakfasts and Suppers. If any are sick, they are still kept and maintained in the Work-house, and such Things allow'd them as they can eat. When any Persons refuse to go to the Work-house, they are allow'd little or no Collection, but must provide for their own Subsistance. The Poor who belong to the House wholly, are cloath'd as well as fed and lodg'd. It is judg'd that the Board of every poor Person in the House is twelve-pence a Week a piece Charge to the Parish. As to Firing, Cloaths, Rent of the Work-house, the Master of the Work-house is not concern'd about these, but the Overseers of the Poor are to take Care to provide them, tho' they usually employ the Master of the Work-house in these affairs. Olney in Bucks, Dec. 31, 1724. THE first Design of the Work-house here was, that Expences of the Parish in the maintaining their Poor might be contracted, and that the Poor receiving Collection, might be more effectually provided for. As to reducing the Expences of the Parish, the Poor's Rates, before the erecting of this Work-house, were three Shillings and nine-pence in the Pound, and now reduced to one and nine-pence. To bring this about, the Town in the first place purchased a piece of Ground adjoining to an House belonging before to the Poor, which purchase was about forty pounds; the whole is now reckoned worth 150l. including the Worth of the Poors House before. To see that due Orders are kept in the Work-house, a Master is provided to super-intend it, whose Business is to keep the Poor to their Work, to see to the buying in, and dressing the provision, to give an Account of the Work done, and what is expended: The Master is maintained out of the Provision of the House, and a Salary allowed him of 16l. per Annum. The Work which is done ordinarily in the House (the Inhabitants being most of them old) comes now to about 15s. a Week, which is given to the Parish Officers, as a part of what is to contribute to the maintaining them. The Persons admitted into the Work-house, are admitted by the Consent of the Parish first obtained; and, being found too poor to subsist independently of some Help, are there maintained, after having first delivered up all their Goods into the Parish-Officers Hands. The Parish provides them with all necessary Cloathing besides Diet, and keeps them, when sick, in a more comfortable manner. The Number of Poor in the Work-house, is sometimes greater, and sometimes less, but is generally about thirty, and the Meat, Drink, Washing, Firing, etc. is reckon'd at about thirty Shillings a Week. The Persons belonging to the Work-house, are supposed to be such as are like to be a continual Parish Charge; for as to those who are only contingently so, by Sickness happening to them, they have Helps allowed them during the Continuance of those unfortunate Circumstances, by which they were reduced. The Poor of the House have hot Meat twice a Week, they are allowed Cheese, their Bread is two parts Wheat to one of Barley; and for their small Beer, two Bushels are allowed to the Hogshead. It is owing to the erecting of this Work-house, that several Hands, which would be either otherwise idle, or ill employ'd in the breaking Hedges, and such like Acts of Dishonesty, are commendably engaged in Labours innocent, useful, and advantageous. An Extract of the Orders in the Work-house of Olney. THAT no Person shall be out into the House, to be there kept, without a License under the Hands of five of the chiefest Free-holders and Inhabitants of the said Parish, and the Hands of the Overseers of the Poor, and of as many more of the rest of the Free-holders and Inhabitants Hands as will sign the same. THAT if any Person shall come into the said House themselves, or bring in any Child or Children to be there kept, without such License as abovenamed, they shall be sent to Bridewell, and further punished. THAT if any Person refuse to work orderly, and so many Hours as the Master of the House shall command them, they shall be sent to the House of Correction. THAT if any Person will not work, pretending Sickness, which may be discover'd by their Stomachs, or otherwise, they shall be severely punish'd. THAT if any Person shall go a begging, or charing, that is kept in the said House, they shall be sent to Bridewell. THAT if any Person shall sell any Thing or Goods that are seized by the Overseers of the Poor, they shall be punish'd as the Law directs. THAT the poor People in the Work-house, if of healthful Bodies, and able, shall in Summer rise at five, or before that time, and go to Bed at nine. THAT if any one in the Work-house shall convey, take, or steal either Wood, Coals, Cloaths, Lace, or any thing belonging to the Work-house, or to any body else there, they shall be punished as the Law directs, with the utmost Severity. THAT if any Person shall presume to cut off the Seal affixed to the end of their Lace, they shall be severely punished. THAT on Saturday in every Week, at four a Clock in the Afternoon, the Overseers of the Poor shall meet, and the Freeholders and Inhabitants, who are willing, may meet, to adjust the Week's Accounts for the Poor, enquire how the Poor in the House are used, and whether any Abuses have been there committed, and what else is needful to be done for the Week ensuing. THAT the Master of the Work-house shall every Week, at the end of his Accounts, set down in Writing all the Disorders committed in the House that Week, that the Offenders may be examined by the Freeholders and Inhabitants, and punished as they deserve. Hanslope, Bucks, Dec. 31, 1724. The Overseers of the Poor having hired a convenient House, and furnished it with Beds, and other necessary Utensils, send thither all Sorts of People, young and old, that from time to time become chargeable to the Parish, (and especially if they become noisy, and are not content with small Allowance, as one Shilling a Week at furthest) by this Method sometimes single Persons, aged or infirm, sometimes whole families, Widows, and their Children, are sent in, to be there provided with Meat, Drink, Lodging, and Physick too, if need be. Such of the Poor as are able, are set to Lace-making, and the Children that know not how to make Lace, are taught it there, by a proper Person hired by the Parish for that Purpose. The Person mention'd as teaching them to work, is the Master of the Work-house, who being some poor Man, lives with them in the House, and together with his Wife, manages the whole Family, takes in and dresses their Meat, brews their Beer, &c. and sees that they be kept clean ; his Salary for so doing is five Shillings a Week, or thirteen Pounds a Year, and his Share of such Provision and Lodging as the House affords. They have Flesh-Meat twice a Week, on Sundays and Thursdays ; when the Meat is bought, there is so much taken in, as will allow one pound weight a Head for both of these Meals ; that is to say, so many pounds of meat are taken in weekly, as there are Persons in the House. On other Days, their Diet is only a piece of wheaten Houshold Bread and small Beer, and sometimes a Pudding. For Breakfasts and Suppers, they have always somewhat hot, as Broth after Flesh Days, at other Times Milk-Porridge, or the like. The Poor are cloathed in Linsey-Woolsey, at the Parish Charge, from time to time severally, as they have need, and have Shoes, Stockings, &c. provided. After this Method, each Person, taking one with another, allowing for all repairs of Houshold Stuff, and Governours Wages also, cloathing, and keeping sick and well, is suppos'd not to stand the Parish in above 18d. a Week ; and by this Means the Poors Levies, which formerly were six or eight yearly, are now reduced to under four, that is to say, one Moiety at least. If any are sick, there is a Difference of eating made, and an Apothecary sent in to take Care of them. The Master's Salary is usually paid out of the Manufacture (altho' there are not above 10 Pair of working Hands, and those most Children that are learning) which Manufacture the Master takes, sells, and accounts for to the Parish. A parliamentary report of 1777 recorded parish workhouses in operation in Newport Pagnell (for up to 80 inmates), Olney (30), Hanslop (40), Lavendon (15), Stoke Goldington (18), Wavendon (12), and Moulsoe. 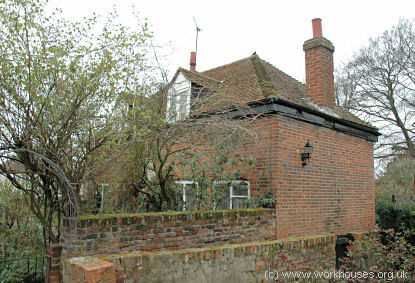 Two surviving buildings in Newport Pagnell are recorded as having served as parish workhouses. The first, located on Pagg's Court as known as Christie's School House, was erected by Samuel Christie in 1702. 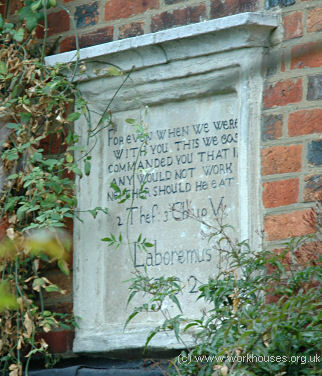 The house bears a plaque which proclaims the fate of those who do not work. 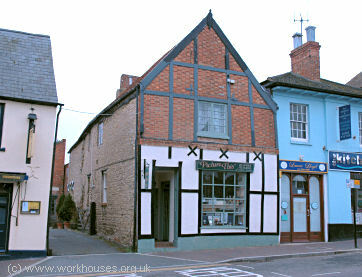 A house at 16 St John Street is also believed to have one time been used as a workhouse. Newport Pagnell St John Street, 2005. County of Buckingham: Astwood, Bletchley, Bradwell, Bow Brickhill, Great Brickhill, Little Brickhill, Broughton, Castle Thorpe [Castlethorpe], Chicheley, Clifton Reynes, Cold Brayfield, North Crawley, Emberton, Gayhurst, Great Lindford [Linford], Hanslope, Hardmead, Haversham, Lathbury, Lavendon, Little Lindford [Linford], Loughton, Milton Keynes, Moulsoe, Newport Pagnell (3), Newton Blossomville, Newton Longville, Olney (2), Ravenstone, Shenley Church End, Sherington, Simpson, Stantonbury, Stoke Goldington, Fenny Stratford, Tyringham with Filgrave, Walton, Warrington, Water Eaton, Wavendon, Weston Underwood, Willen, Great Woolstone, Little Woolstone, Woughton-on-the-Green. Later Additions: Bradwell Abbey (from 1861), New Bradwell (from 1919), Olney Park Farm (from 1861), Petsoe Manor (from 1861). The population falling within the Union at the 1831 census had been 22,087 with parishes ranging in size from Stantonbury (population 51) to Newport Pagnell itself (3,385). The average annual poor-rate expenditure for the period 1832-35 had been £17,277 or 15s.8d. per head. The Guardians opened the design of the new union workhouse to competition. On 18th November 1835, they met to consider thirteen sets of plans and estimates. The six most expensive designs, all costing in excess of £4,500 were not inspected. Of the remainder, the two favoured designs were one by William P Roote for 330 inmates at a cost of £4,340, and one from George Gilbert Scott for 312 inmates at a cost of £4,200. Roote, who was also the architect of workhouses at Newmarket and Leighton Buzzard, was finally chosen. His design for Newport Pagnell was very similar for that adopted by Leighton Buzzard. In 1836, the Poor Law Commissioners authorised a total expenditure of £7,000 on the building to accommodate 300 inmates. The workhouse location and layout are shown on the 1925 map below, by which time it was officially known as Newport Pagnell Poor Law Institution. 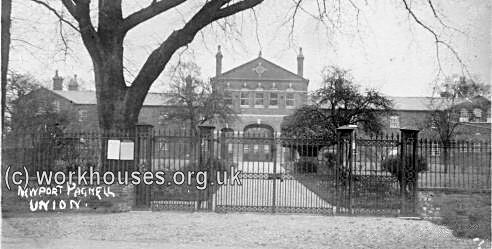 Newport Pagnell workhouse site, 1925. The layout of the building was unusual. The front part of the main building at the west comprised four two-storey ranges enclosing a square courtyard. At the rear, single storey outbuildings formed a semi-hexagon in outline. Newport Pagnell site, early 1900s. After 1948, the former workhouse later became Renny Lodge Hospital and latterly served as a hospice. Newport Pagnell job advertisement, 1873. The former workhouse buildings were demolished in about 1994. In 2000, the site was empty and awaiting redevelopment. Centre for Buckinghamshire Studies, County Hall, Walton Street, Aylesbury, Bucks HP20 1UU. Relatively few records survive — holdings include Guardians' minute books (1835-56, 1859-1930).